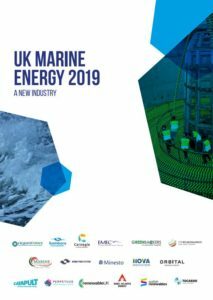 UK Marine Energy 2019 – The potential of the UK’s world-leading tidal and wave power sectors is laid out in a new report launched today (19thMarch 2019). ITPEnergised along with a group of leading UK wave and tidal energy stakeholders contributed to the report which was led by the Marine Energy Council, RenewableUK and Scottish Renewables. The technology’s successes to date – including the world’s first grid-connected tidal array – are outlined in the document, which also sets out an economic blueprint for the sectors, which remain “effectively locked out of the UK energy market”. As a member of the Marine Energy Council, ITPEnergised is actively engaged in presenting the marine energy sector’s case to UK Government and working with government departments to develop revenue support mechanisms that provide a route to market and means to commercialise our world leading technologies. Innovation CfD (iCfD) which is a bridging revenue support mechanism to allow the ramp up of deployment for larger projects. This uses the existing CfD mechanism, but is limited to new technologies such as wave, tidal stream, Advance Combustion Technology (ACT) and others that BEIS might wish to support. ITPEnergised has been working in the marine energy sector since 1991 and has been involved in over 130 projects across 23 countries. Our team of marine energy experts, based in Bristol, offer technology and project development services as well as commercial, financial and policy advice. For more information, see our marine energy capability statement here.